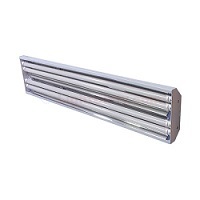 This lamp is part of the series Ready Highbay Fixtures that houses a four LED T8 Lamps. The BLHT4XT8USE4810 fixture operates off of a standard 120 Volts through 277 Volts . They are designed to have knockouts on each end for motion sensor mounting. It is engineer to operate with the latest single ended LED T8 lamps. This product also comes with a 5 year warranty . Houses: 4 T8 Lamps.Lamps not included. 22 Gauge Galvanized Steel, white post painted baked on enamel.